Captain Jackson, Henry: Sick in quarters Oct. 20 to Nov. 9, 90. Sprain of back contracted in line of duty, Commanding troop. First Lieutenant Hare, Luther R.: Sick in quarters Dec. 7 to 11, 90, “Muscular rheumatism” contracted in line of duty. Relieved from duty with troop and ordered to Ft Riley, Mo., 15 Dec. 90 per Special Order 15 Headquarters Department of the Platte, in the field Dec. 15, 90 on account of physical disability, absent sick at Ft Riley, Kas. Second Lieutenant Donaldson, Thomas Q.: On duty with troop, sick in quarters Dec. 11 to 14, 90, sprain foot contracted in line of duty. First Sergeant Turney, John B.: Enlisted on Jan. 19, 88 at Fort Riley, Kansas, by Lt. McCormick. Sergeant Tompson, Adolf J.: Enlisted on Oct. 1, 88 at Fort Riley, Kansas, by Lt. McCormick. Sergeant Dorsner, Oscar: Enlisted on Nov. 9, 88 at Fort Meade, Dakota Territory, by Lt. Kennedy. Due U.S. for Ordnance and Ordnance stores eight dollars and forty five cents ($8.45). Sergeant Newport, John J. C.: Enlisted on Jan. 1, 87 at Cincinnati, Ohio, by Lt Hunter. Sergeant Dolan, John: Enlisted on Jan. 1, 87 at Fort Buford, Dakota Territory, by Lt. Garlington. Transferred to troop ‘C’ 7th Cav. from troop ‘L’ per Order 90 Headquarters 7th Cav. Dec. 12, 90, joined troop Dec. 12, 90. Sergeant Wetz, George: Enlisted on Nov. 9, 81 at New York, New York, by Capt. Moore. Retained in service to make good time lost by desertion. Corporal Sorenson, Peter: Enlisted on Nov. 4, 87 at Boston, Massachusetts, by Capt. Miller. Absent on furlough for 3 months since Nov. 10, 90. Corporal Casner, Forest J.: Enlisted on Dec. 8, 88 at Cleveland, Ohio, by Capt. Kellogg. Corporal Horton, Walter A.: Enlisted on Nov. 10, 87 at Saint Louis, Missouri, by Capt. Morgan. Absent on furlough for 3 months since Nov. 10, 90. Corporal Baus, Jacob: Enlisted on Jan. 26, 86 at Pittsburgh, Pennsylvania, by Lt. Adams. Appointed Corporal per Order 82 Headquarters 7th Cav. Ft Riley, Ks., 14 Nov. 1890 to date Nov. 13, 90. Trumpeter Connolly, Thomas: Enlisted on Jul. 28, 87 at Chicago, Illinois, by Capt. Heunson. Trumpeter Renand, Emil: Enlisted on Dec. 20, 89 at Baltimore, Maryland, by Capt. Hamilton. Sick in quarters Dec. 13th to 16, 90 sprain of back, contracted in line of duty. Blacksmith Andolik, Vaclao: Enlisted on Sep. 11, 86 at Chicago, Illinois, by Capt. Hennesee. Saddler Graham, Horace: Enlisted on Jun. 6, 90 at Buffalo, New York, by Capt. VanOrsdale. Appointed saddler per Special Order 11 Ft Riley, Ks., Nov. 3, 1890 to date Nov. 1, 90. Wagoner Hayden, Charles W.: Enlisted on May 31, 90 at Newark, New Jersey, by Capt. Cooper. Private Bangs, Ralph: Enlisted on Aug. 4, 88 at Springfield, Massachusetts, by Capt. Ropes. Tried by summary court and sentenced to forfeit five (5) dollars of his pay, per Special Order 2 Camp Pine Ridge Agency, SD Dec. 3, 90. Private Butler, William A.: Enlisted on Apr. 18, 89 at New York, New York, by Capt. Wagner. Private Butler, Ernest: Enlisted on May 25, 86 at Saint Louis, Missouri, by Lt. Craig. On detached service Ft Riley, Ks., since Nov. 24, 90. Private Cester, Christ: Enlisted on Mar. 9, 89 at Cleveland, Ohio, by Capt. Heiner. Private Cester, Theodor: Enlisted on Mar. 11, 89 at Cleveland, Ohio, by Capt. Heiner. Private Cester, William: Enlisted on Mar. 11, 89 at Cleveland, Ohio, by Capt. Heiner. * Private Claussen, Peter: Enlisted on Apr. 22, 89 at Buffalo, New York, by Capt. Drum. Tried by General Court Martial and sentenced to forfeit to the U.S. eight (8) dollars per month of his pay for four (4) months per General Order Headquarters Department Missouri Sept. 22, 90, paid eighteen dollars and forty cents ($18.40) on rolls Nov. 30, 90. Due U.S. for Quartermaster Stores twenty (20) cents. Sick in Hospital Dec. 30 & 31, 90, gunshot wound, left buttock, contracted in line of duty, wounded in action with hostile Indians White Clay Ck., Dec. 30, 90. Private Doba, Joseph: Enlisted on Aug. 26, 89 at New York, New York, by Capt. Gageby. Private Flemming, Hannibal S.: Enlisted on May 24, 90 at Johnstown, Pennsylvania, by Capt. Kendall. Private Fordish, Elvin: Enlisted on Aug. 15, 90 at Boston, Massachusetts, by Capt. Carpenter. Assigned to troop per Order 88 Headquarters 7th Cav. Dec, 6, 90 to date Nov. 28, 90. Joined troop Dec. 6, 90. Due U.S. Laundry seventy eight (78) cents. Private Ganson, William: Enlisted on Apr. 21, 90 at Cleveland, Ohio, by Lt. Booth. Sick in Hospital Dec. 14 to 16, 90, contusion left side, right thigh and right shoulder contracted in line of duty. * Private Green, William H.: Enlisted on Sep. 11, 90 at Buffalo, New York, by Lt. Scott. Assigned to troop per Order 88 Headquarters 7th Cav. Dec. 6, 90 to date Nov. 28, 90. Joined troop Dec. 6, 90. Due U.S. subsistence stores ninety two (92) cents. Due U.S. Laundry sixty two (62) cents. Sick in Hospital Dec. 29 to 31, 90, gun shot wound left thigh contracted in line of duty, wounded in action with Hostile Indians, Wounded Knee Ck. SD, Dec. 29, 90. Private Gross, Harry P.: Enlisted on Nov. 10, 87 at Philadelphia, Pennsylvania, by Capt. Kendall. Sick in Hospital Sept. 30 to Nov. 9, 90, intermittent fever, contracted in line of duty. Private Harrington, Mike E.: Enlisted on Sep. 4, 90 at Boston, Massachusetts, by Capt. Miller. Assigned to troop per order 88 Headquarters 7th Cav. Dec. 6, 90 to date Nov. 28, 90. Joined troop Dec. 6, 90. Due U.S. Laundry Forty (40) cents. Private Hunter, William J.: Enlisted on Nov. 14, 88 at Boston, Massachusetts, by Capt. Miller. Private Knott, Walker: Enlisted on Jul. 26, 89 at Fort Riley, Kansas, by Lt. McCormick. Private Kreynest, George: Enlisted on Nov. 12, 87 at Jefferson Barracks, Missouri, by Lt. Fountain. Absent on furlough since Nov. 13, 90. Private Lare, William R.: Enlisted on Dec. 14, 89 at Fort Logan, Colorado, by Lt. Johnson. On Special Duty Company cook since Nov. 24, 90. Private Lawton, Denis: Enlisted on Oct. 29, 87 at New York, New York, by Lt. Wheeler. Absent on furlough since Nov. 10, 90. Private Litterer, George: Enlisted on Nov. 16, 88 at Newark, New Jersey, by Lt. Darker. Tried by General Court Martial and sent to be dishonorably discharged the service of the U.S. forfeiting all pay and allowances due him and to be confined at hard labor under charge of the post guard for two (2) months. Sentence mitigated to a forfeiture of ten (10) dollars per month for two (2) months and confinement at hard labor for the same period, per General Court Martial Order 35 Headquarters Department Missouri Nov. 15, 90. Absent in confinement at Ft Riley, Ks., since Nov. 24, 90. Private Lynch, Richard: Enlisted on Sep. 26, 90 at Boston, Massachusetts, by Capt. Kendall. Assigned to troop per Order 88 Headquarters 7th Cav. Dec. 6, 90 to date Nov. 28, 90. Joined troop Dec. 6, 90. Due U.S. Laundry fifty six (56) cents. Private Markum, Jonathan: Enlisted on Jan. 27, 87 at Cincinnati, Ohio, by Lieut. Kanter. Private McBride, John: Enlisted on Feb. 2, 89 at Boston, Massachusetts, by Capt. Miller. On Special Duty Company cook since Nov. 24, 90. Private McCullum, Donald: Enlisted on Jan. 11, 88 at Baltimore, Maryland, by Capt. Huggins. Reduced to rank from Sergeant at own request per Order 90 Headquarters 7th Cav. 12 Dec 90. Private McClusky, Thomas: Enlisted on May 12, 90 at Boston, Massachusetts, by Capt. Kendall. Private McGuire, Henry: Enlisted on Apr. 5, 90 at Saint Louis, Missouri, by Capt. Kauffman. Assigned to troop per Order 88 Headquarters 7th Cav. Dec. 6, 90 to date Nov. 28, 90. Joined troop Dec. 6, 90. Due U.S. Laundry Sixty two (62) cents. Private Meyer, John: Enlisted on Nov. 10, 87 at Philadelphia, Pennsylvania, by Lt. Scott. Absent on furlough Nov. 10 to 12, 90. Private Michel, Otto: Enlisted on Nov. 20, 88 at Saint Louis, Missouri, by Lt. Guilford. Private Morris, Frank C.: Enlisted on Jun. 6, 90 at Detroit, Michigan, by Lt. Lockett. Assigned to troop per Order 88 Headquarters 7th Cav. Dec. 6, 90 to date Nov. 28, 90. Joined troop Dec. 6, 90. Due U.S. Laundry One (1) dollar and thirty nine (39) cents. Private Murphy, Frederick B.: Enlisted on Sep. 26, 90 at Fort Riley, Kansas, by Lt. McCormick. Tried by Summary court and sentenced to suffer a stoppage of six dollars and fifty cents ($6.50) per month until the U.S. is reimbursed twelve dollars and ninety five cents ($12.95) price of the Buffalo Overcoat and to forfeit to the U.S. seven (7) dollars of his. Private Murray, John J.: Enlisted on Oct. 7, 87 at Denver, Colorado, by Lt. Borden. Transferred to troop from troop “G” 7th Cav. per Order 87 Headquarters 7th Cav. Dec. 3, 90. Joined troop Dec. 3, 1890. Reduced from Sergeant at own request in troop “G” per Order 86 Headquarters 7th Cav. Nov. 30, 90. Private Nilson, Nils C.: Enlisted on Jul. 29, 90 at Fort Riley, Kansas, by Lt. McCormick. Due U.S. for Camp and Garrison Equipage one (1) dollar. Private O’Riordan, Daniel: Enlisted on Nov. 19, 88 at New York, New York, by Capt. Montgomery. Private Paige, George D.: Enlisted on Sep. 4, 90 at Boston, Massachusetts, by Capt. Kendall. Assigned to troop per Order 88 Headquarters 7th Cav. Dec. 6, 90 to date Nov. 28, 90. Joined troop Dec. 6, 90. Due U.S. Laundry Forty (40) cents. Absent sick at Fort Robinson, Nebraska from Dec. 2 to 16, 90 with acute bronchitis contracted in line of duty. Never joined troop. Private Rooks, Harry: Enlisted on Dec. 19, 87 at Buffalo, New York, by Capt. Crowell. Private Roscher, Charles C.: Enlisted on Apr. 15, 89 at Saint Louis, Missouri, by Capt. Morgan. Private Russell, Fred J.: Enlisted on Jul. 2, 90 at Boston, Massachusetts, by Capt. Kendall. Assigned to troop per Order 88 Headquarters 7th Cav. Dec. 6, 90 to date Nov. 28, 90. Joined troop Dec. 6, 90. Due U.S. for subsistence stores Three (3) dollars and eighteen (18) cents. Due U.S. Laundry Seventy four (74) cents. Sick in quarters Dec. 5 to 7, 11 to 14 and in Hospital 15 to 27, 90, contused wound of scalp, contracted in line of duty. Private Schnieder, Joseph: Enlisted on Jun. 10, 89 at Newark, New Jersey, by Lt. Carter. On Special Duty as baker since Nov. 29, 90. * Private Schriver, Erven: Enlisted on Feb. 15, 87 at Cleveland, Ohio, by Capt. Vernon. Wounded in action with hostile Indians Wounded Knee Ck., S.D. Dec. 29, 90. Sick in Hospital Dec. 29 to 31, 90. Gun shot wounds both thighs contracted in line of duty. Private Scott, Charles: Enlisted on Sep. 23, 89 at Fort Riley, Kansas, by Capt. Grugan. Sick in Hospital Oct. 2 to Dec. 11, 90, Intermittent fever contracted in line of duty. Absent sick at Ft Riley, Kas., since Nov. 24, 90. Private Seeberger, Louis: Enlisted on May 21, 90 at Columbus Barracks, Ohio, by Lt. Williams. Assigned to troop per Order 88 Headquarters 7th Cav. Dec. 6, 90 to date Nov. 28, 90. Joined troop Dec. 6, 90. Due U.S. Laundry Sixty five (65) cents. Private Shaughnessy, William J.: Enlisted on Feb. 1, 89 at New York, New York, by Capt. Bisbee. Private Stevenson, Frank: Enlisted on Jul. 26, 90 at Newark, New Jersey, by Capt. Cooper. Assigned to troop per Order 88 Headquarters 7th Cav. Dec. 6, 90 to date Nov. 28, 90. Joined troop Dec. 6, 90. Due U.S. Laundry Sixty eight (68) cents. Private Thomas, Joseph J.: Enlisted on Aug. 30, 88 at Boston, Massachusetts, by Capt. Miller. Private Tully, Thomas: Enlisted on Nov. 14, 88 at Newark, New Jersey, by Lt. Carter. Private Vetter, Thomas: Enlisted on Aug. 16, 89 at Saint Louis, Missouri, by Capt. Morgan. Private Warner, Charles: Enlisted on Oct. 25, 88 at Washington, District of Columbia, by Lt. Satterlee. Tried by Summary court and sentenced to forfeit Three (3) dollars of his pay per Order 255 Ft Riley, Ks., Nov. 14, 90. Paid on rolls Nov 30, 90. Private Clippert, James W.: Enlisted on Dec. 28, 87 at Detroit, Michigan, by Capt. Load. Discharged at Ft Riley, Kas., Nov. 4, 1890 per Special Order 254 Headquarters Army Adjutant General Order 30 Oct. 90 under provisions General Order 81 A.G.O. S. 90. Discharge and final statement given Character “Very good.” Due soldier for clothing not drawn six dollars and forty five cents ($6.45). Private Hatch, Edward G.: Enlisted on Sep. 4, 87 at Cleveland, Ohio, by Capt. Vernon. Discharged at Pine Ridge Agency Dec. 13, 90 per Special Order 168 Headquarters Department Missouri. Dec. 6, 90 while on furlough under provisions General Order 80 A.G.O. S. 1890. Discharge and final statement mailed. Character “Excellent.” Due soldier for clothing not drawn Twenty one (21) dollars and fifty seven (57) cents. Private Johnston, Samuel: Enlisted on Dec. 4, 85 at Fort Meade, Dakota Territory, by Lt. WilKinson. Discharged at Ft Riley, Ks., Dec. 5, 1890. Expiration term of service. Discharge and final statement given. Character “Good.” Due soldier for clothing not drawn twelve (12) dollars and seventy three (73) cents. Due U.S. for Camp and Garrision equipage One dollar and two cents ($1.02). Private Keazer, George L.: Enlisted on Dec. 4, 85 at Fort Meade, Dakota Territory, by Lt. Wilkinson. 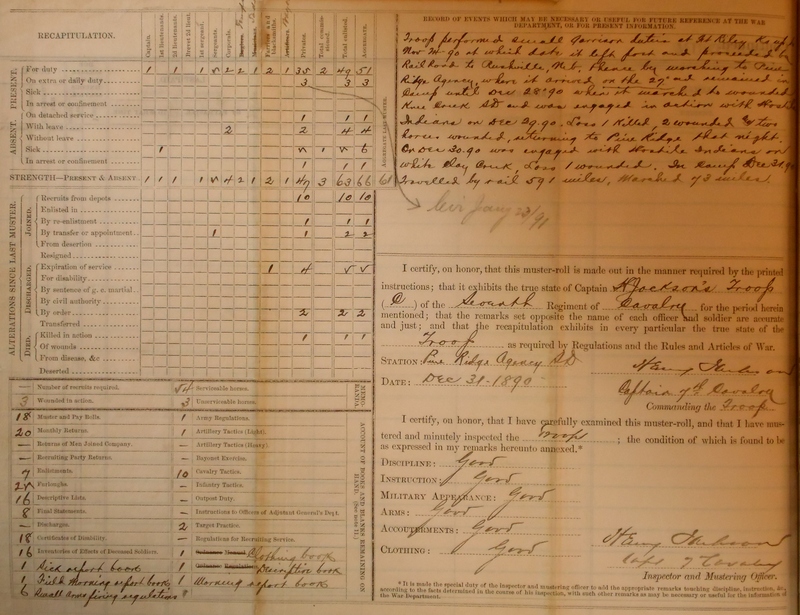 Discharged at Ft Riley, Kas., Dec. 3, 1890. Expiration term of service. Discharge and final statement given. Character “Excellent.” Due soldier for clothing not drawn Twenty seven dollars and thirty six cents ($27.36). Private Stark, Frank: Enlisted on Nov. 3, 85 at Fort Leavenworth, Kansas, by Lt. Cheever. Discharged at Ft Riley, Ks., Nov. 2, 1890. Expiration term of service. Discharge and final statements given. Character “Good.” Due soldier for clothing not drawn One hundred and seven dollars and eighty nine cents ($107.89). Private Jordan, John: Enlisted on Nov. 28, 85 at Fort Meade, Dakota Territory, by Lt. Wilkinson. Discharged at Pine Ridge Agency, SD Nov. 27, 90. Expiration term of service. Discharge and final statement given. Character “Very good.” Due soldier for clothing not drawn, Twenty five dollars and eighty five cents ($25.85). Private Brewster, James A.: Enlisted on Dec. 28, 85 at Detroit, Michigan, by Capt. King. Tried by General Court Martial and sent to be confined at hard labor under charge of post guard for four (4) months and to forfeit ten (10) dollars per month for the same period per General Court Martial 35 Headquarters Department Missouri Nov. 15, 90. Sentence unexecuted portion of remitted per Special Order 291 Headquarters Army Adjutant General Order Dec. 13, 90. Discharged at Ft. Riley, Ks., Dec. 27, 90. Expiration term of service. Discharge and final statement given, character “Good.” Objection to enlistment “insobriety.” Due soldier for clothing not drawn twelve dollars and ninety six cents ($12.96). § Private DeVreede, Jan: Enlisted on Dec. 2, 86 at Jersey City, New Jersey, by Capt. Vroom. Tried by Summary Court and sentenced to forfeit Three (3) dollars of his pay per Order 255 Ft. Riley, Ks., Nov. 14, 90. Paid on rolls Nov. 30, 90. Tried by Summary Court and sentenced to forfeit seventy five cents ($0.75) of his pay per Field Order 7 Camp Pine Ridge Agency, SD Dec. 12, 90. Killed in action with hostile Indians, Wounded Knee Creek, SD Dec, 28, 90. Due soldier for retained pay thirty eight dollars and seventy cents ($38.70). Due U.S. for clothing overdrawn three dollars and sixty cents ($3.60). The Recapitulation and Record of Events Page of Captain Jackson’s C Troop, 7th Cavalry Regiment’s Muster Roll of December, 1891. Troop performed small Garrison duties at Ft Riley, Ks., up to Nov. 24, 90 at which date it left post and proceeded by Rail Road to Rushville, Neb. thence by marching to Pine Ridge Agency, where it arrived on the 27th and remained in camp until Dec. 28th, 90 when it marched to Wounded Knee Creek, SD and was engaged in action with Hostile Indians on Dec. 29, 90. Loss 1 Killed, 2 wounded and two horses wounded, returning to Pine Ridge that night. On Dec. 30, 90 was engaged with Hostile Indians on White Clay Creek, loss 1 wounded. In camp Dec. 31, 90. Traveled by rail 591 miles, marched 73 miles. Source: Adjutant General’s Officer, “7th Cavalry, Troop C, Jan. 1885 – Dec. 1897,” Muster Rolls of Regular Army Organizations, 1784 – Oct. 31, 1912, Record Group 94, (Washington: National Archives Record Administration). 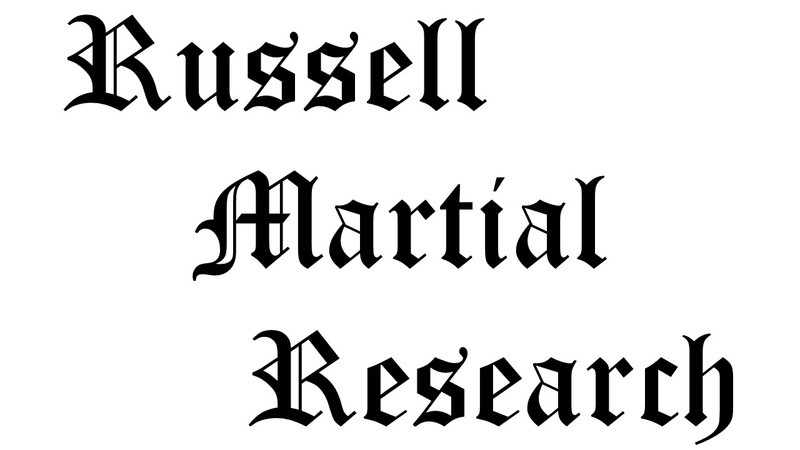 Citation for this article: Samuel L. Russell, “C Troop, 7th Cavalry Regiment, Muster Roll,” Army at Wounded Knee (Sumter, SC: Russell Martial Research, 2013-2014, http://wp.me/p3NoJy-of), posted 24 Jan 2014, accessed __________. This entry was posted in Muster Rolls, Official Reports and tagged 1890, 7th Cavalry, 7th Cavalry Regiment (United States), Cavalry, Forsyth, James Forsyth, Pine Ridge, Pine Ridge Agency, Pine Ridge Indian Reservation, Wounded Knee, Wounded Knee Creek, Wounded Knee Massacre. Bookmark the permalink.